Do you feel like 2015 just didn't do it for you in the music arena? You're not alone. There were some standouts, but a few roses in the middle of a desert have very little competition. But then you find something special - an oasis. 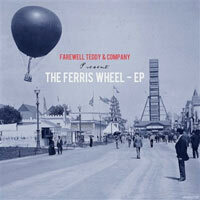 Indie newcomers Farewell Teddy are giving listeners a refreshing glimpse of musical ecstasy with their debut release, The Ferris Wheel EP. The album opens with the short and eclectic folky prologue, "1893." The lead singer, James Brown, wails with the force of a locomotive and the tone of an untethered David Crowder. The track flows seamlessly into "Connoisseur of the Boulevard." Brown's vocals walk a tight wire of pitch as he goes flat near the beginning of the track, but it surprisingly matches the rustic and rugged sound of the song, thus it's easily overlooked (or better yet, acceptable). "I'm Not Afraid of Torture" continues the raw sound, but with a more old-style country tanginess. A major highlight of the track is the concluding yodels that feel so natural that listeners may attempt the vocal exercise without any prompting. In addition, a major element of these tracks has been the richness of the percussion, not limited to simply a drum set or overly synthetic fillers. The album concludes with "Veni Creator Spiritus (Michelangelo, What For?)." It's essentially a percussive celebration with a very intriguing audio track playing over the music. It nearly feels like the end of a superhero movie with a second ending, hinting at the future. If listeners haven't bought in by the third track, they might after this one. Overall, the EP is an excellent introduction to the indie newcomers. Their eclectic collection of lo-fi raw elements shows some aggressive yet tempered ambition. The only complaint for this EP is how short it is, and that's not a bad problem to have. Farewell Teddy's music is so gripping that it makes the listener want more. If you've got about 12 minutes, that's all you need for an appetizer of goodness. Furthermore, with a commitment to a full-length album in 2016, the new year looks very bright with folks like Farewell Teddy releasing music.